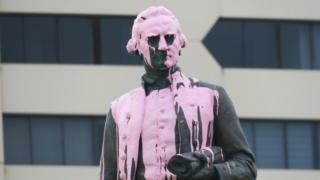 25 January 2018 -A statue of British explorer Captain James Cook has been vandalised in Melbourne in an apparent protest on the eve of Australia Day. The statue was found covered in paint on Thursday. Graffiti depicted an Aboriginal flag and the words: “We remember genocide”. Australia Day, the anniversary of British settlement, causes annual debate over indigenous sensitivities. The Australian government said the vandalism was “disgraceful”. “These vandals are trashing our national heritage and should be prosecuted,” tweeted Minister for Citizenship and Multicultural Affairs Alan Tudge. Police said they were investigating the incident but no suspects had been identified. The national celebration falls on 26 January, the day in 1788 when Britain’s First Fleet landed in Sydney Cove. Captain Cook had made it to Australia’s east coast in 1770. Many indigenous Australians have said that the Australia Day celebration is hurtful. Several protests are planned for around the nation on Friday after similar events in recent years. However, the government has consistently defended the celebration. Last year, a statue of Captain Cook in central Sydney was also vandalised with messages including “change the date” and “no pride in genocide”. It followed a high-profile public debate about whether it was appropriate for the statue to carry a plaque saying “discovered this territory”. Prime Minister Malcolm Turnbull condemned the vandalism at the time, drawing a comparison with Soviet dictator Joseph Stalin. “When [Stalin] fell out with his henchmen he didn’t just execute them, they were removed from all official photographs – they became non-persons, banished not just from life’s mortal coil but from memory and history itself,” he said. January 26, 2018 – In the early hours of January 26th, 2018, banners were hung around so-called Armidale, NSW, with one facing out onto the parklands where Australia Day Festivities would be held later that day, reading “NO PRIDE IN GENOCIDE – JAN 26 = INVASION DAY”. This action was taken by non-Indigenous people as a minimal act of solidarity with the ongoing struggles of First Nations peoples. January 25, 2018 – Anti-colonial poster & banner action for #7DaysOfResistance on occupied territory of the Boon Wurrung, Kulin Nations. South Eastern suburbs of so-called-Melbourne, ‘Australia‘. Abolish Australia Day, Solidarity with the Aboriginal Resistance, Burn the Butcher’s Rag. January 18, 2018 – On 15 January 2018, a group of anarchists in Narrm (so-called Melbourne, Australia), undertook a solidarity statement effort in support of our anarchist comrade, “Aachen Lisa”, who is serving seven and a half years imprisonment in Germany for a bank expropriation in the city of Aachen. At a prominent tourist attraction, St. Patrick’s Cathoholic Cathedral (the cathedral church of the Roman Catholic Archdiocese of Melbourne, and seat of its archbishop, Denis Harta), we displayed a banner reading “Seditious solidarity with ‘Aachen Lisa’. Uncompromising resistance to patriarchy, church, capital, and state!”. We then hung the banner in a predominant and highly visible position on the gates of the State Parliament House.